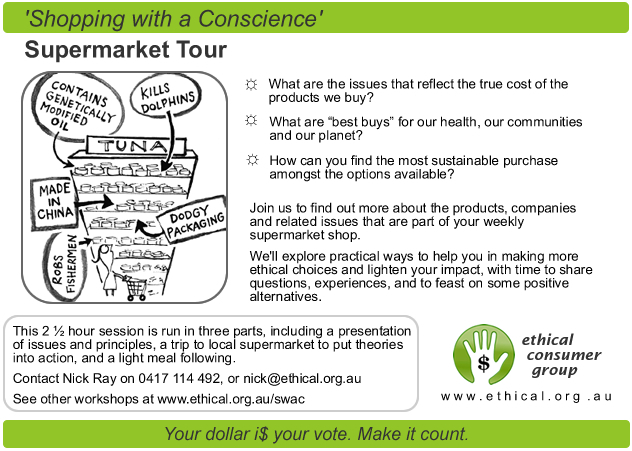 ‘Shopping with a Conscience’ workshops, supermarket tours, and presentations serve as an introduction to sustainable and ethical purchasing practices for the everyday consumer. 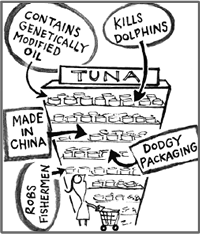 What are the issues that reflect the true cost of the products we buy? What are “best buys” for our health, our communities and our planet? How can you find the most sustainable purchase amongst the options available? Find out more about the products, companies and related issues that are part of your weekly supermarket shopping adventures. 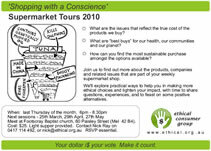 We’ll explore practical ways to help you in making more ethical choices and lighten your impact. Time to share questions, experiences, and to feast on some positive alternatives. We facilitate workshops, supermarket tours and presentations in Melbourne for small groups, work places, churches and community groups. We also have a run your own supermarket tour template. There are two formats to the basic SWAC session. Presentation. 60 minute session involving a 45 minute presentation and then 15 minutes question time. If you’re in Melbourne and are interested in us facilitating a session for your small group, work place, or church community, please contact Nick for 0417 114 492. We encourage you to run your own supermarket tour using our template if you’re not in Melbourne or are unable to make it to one of ours.